Are you a frequent cell phone user? Do you often experience headaches, insomnia, chronic fatigue, inflammation, indigestion, brain fog, mood shifts? Find out how to protect yourself against the damaging aspects of EMF (Electromagnetic Fields), also known as electrosmog. The jury is no longer out on cell phone radiation. Excessive exposure to man-made EMF can seriously undermine your health and life. Thirty years ago, scientists warned of a possible connection between cell phone radiation and cancer, and as the telecommunications industry downplayed it, the public largely ignored it. The technology was too new and exciting, and there were no long-term EMF studies to prove or disprove the accumulative effect of cell phone radiation exposure. After all, it can take decades for a brain tumor to develop. Thirty years later, however, extended research findings and personal testimonials are piling up, and the planet’s six billion cell phone users need to take notice. Cell phone radiation has since been linked to brain tumors, thyroid cancer, Alzheimer’s, Parkinson’s disease, migraines, skin irritation, breast cancer, male infertility, osteoporosis, cardiovascular issues, behavioral problems in children, diabetes and DNA damage. Studies usually reach the same two conclusions. Health risks increase with the amount you use your cell phone. And health problems localize in the areas that are exposed to it. In 1962, scientist Rachel Carson warned the world of the dire environmental consequences of fertilizers and pesticides. Her book Silent Spring proved prophetic when in 2013 the Global Burden Of Disease Study reported up to 95 percent of the world population was sick from a spectrum of chronic conditions due largely to environmental factors. Similarly, epidemiologist Dr. Devra Davis became an environmental whistleblower in 2010 when her book Disconnect – The Truth About Cell Phone Radiation put her among the first wave of scientists to warn the public of the dire consequences of cell phone radiation. Disconnect refers to how most people are still completely unaware that radio frequency radiation is connected to biological functioning. A cell phone, Davis reminds her readers, is a microwave radio that works on much lower power but roughly the same wavelength as a microwave oven. In her lectures, she explains how the biological impact of your cell phone is not related to its charge, which is quite weak, but rather to the erratic nature of its signal and its ability to disrupt resonance and interfere with DNA repair. She cites the work of Dr. Lennart Hardell, a Swedish oncologist and professor who reported seeing the same pattern over and over again. 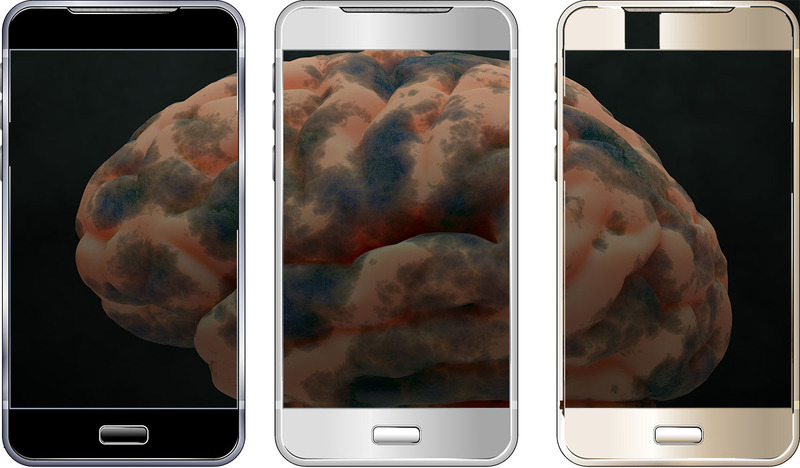 Dr. Hardell found that heaviest cell phone users double their risk of brain tumors after a decade. Similar results were corroborated by scientists in Israel, Finland, Russia, and England. Hardell also showed that those who start using cell phones regularly as teenagers are four times more likely to develop brain cancer around 10 years later. Last year, Hardell led a study published recently regarding a spike in thyroid cancer cases in Nordic countries at about the same time smartphones repositioned their antennas from the top of the phone to the bottom nearer the thyroid gland. This cause and effect has also been noted in another study that showed how a cell phone on your hip may weaken an area of your pelvis. Researchers measured pelvic bone density in 150 men who carried their cell phones attached to their belts an average of 15 hours each day for six years. Researchers discovered that bone mineral density was lower on the side of the pelvis where the cell phones were placed. This study also emphasized that as long as your cell phone is on, it emits radiation intermittently even when you are not actually making a call. Therefore, carrying a cell phone on your person may give an area of your body nearly continuous radiation exposure. Many women stuff their phones in their bras. More and more doctors are saying this is not a good idea because the soft fatty tissue of the breast readily absorbs cell phone radiation. Increasingly, reports show young women with no family history of cancer developing tumors directly underneath the breast area where they’ve placed a cell phones in their bras. Men who carry their cell phones in their pants pockets have worries of their own. A 2016 study by researchers from Poland found that cell phone use for more than 10 years can damage human sperm DNA. Similar findings have been reported in recent studies from China, Egypt, Israel, the Ukraine, the UK and Brazil. At this stage, it’s not just scientists and researchers connecting the dots. Working medical personnel are also witnessing the consequences of long-term cell phone use. “We holistic doctors treating environmental disease know very well that this correlation is real and is very common,” says New York physician Dr. Svetlana Kogan who has 20 years of clinical experience in holistic healing of environmental illnesses like cell phone radiation sickness. As way of example, Kogan refers to the case of a 65-year-old man with mild Parkinson’s who constantly carried his cell phone on him. He complained of feeling fatigued and having a foggy brain. She recommended he keep his cell phone as far away from his body as possible and treated him with pulsed electromagnetic frequency therapy. By the end of 10 sessions, he could walk several blocks more than usual and was able to concentrate on his work much better. Dr. Mark Khorsandi is a migraine surgeon and founder of Houston’s Migraine Relief Center. Nick Angelis, a certified registered nurse anesthetist in the Pensacola, Florida area, says he has seen patients with skin or emotional issues improve once they no longer carried a cell phone in their pocket or held one directly to their heads for long conversations. “There is plenty of evidence showing that the fewer EMFs the better,” says Angelis. Dr. Justin Hoffman is a Licensed Naturopathic doctor and Naturopathic medical doctor practicing in Santa Rosa, California. He says his patients “regularly” have questions about the safety of cell phones. “We have had many patients report problems such as headaches or migraines, vision changes, fatigue, and difficulty concentrating during or after prolonged periods of cell phone use,” says Hoffman. A cell phone is basically a two-way radio that operates with radiofrequency (RF) energy, a form of electromagnetic radiation (EMR). There are two types of electromagnetic radiation: ionizing (x-rays, radon, and cosmic rays) and non-ionizing (radiofrequency and other extremely low frequency forms). Electromagnetic radiation is defined according to its wavelength and frequency or the number of cycles of a wave that pass a reference point per second. These frequencies are described in units called hertz (Hz). The Federal Communication Commission (FCC) has adopted limits for safe exposure to radiofrequency energy called the Specific Absorption Rate (SAR). This is the amount of radio frequency energy absorbed by the body when using a cell phone. By law, cell phones must be sold with an SAR level no more than 1.6 watts per kilogram (1.6 W/kg). Samsung makes the lowest SAR smartphones (0.35 W/kg), while an Apple iPhone 6 Plus exposes a user’s head to a whopping 1.19 W/kg. None of the lowest SAR phones are made by the leading U.S. companies, Apple, Motorola or RIM BlackBerry. The problem with the SAR rating is that it was modeled after a very large adult male and does not take into consideration women, children, or prenatal exposure, who are up to 10 times more sensitive to the radiation. It also fails to address non-thermal free radical reactive oxygen species (ROS) effects linked to DNA damage. Dr. Martin Blank is recognized as the foremost expert of cellular and molecular effects of electromagnetic fields. A retired professor from the department of physiology and cellular biophysics at Columbia University’s Medical Center, he has spent the past few years as a guest lecturer. He talks about how DNA with its “coil of coils” structure is “especially vulnerable” to electromagnetic fields of all kinds. In a report that appeared in the International Journal of Radiation Biology, he explains how DNA possesses the two structural characteristics of fractal antennas, namely electronic conduction and self-symmetry. Blank emphasizes that these two properties of DNA contribute to a greater reactivity to electromagnetic fields than other tissues, making the long-term consequences of repeated microwave-like exposure to our genetic material of “great concern”. Cell phones, laptops, tablets, TVs, and Wi-Fi routers all contribute to electromagnetic radiation pollution and can become problematic. Many municipalities are now switching from analog to Wi-Fi utility meters. Predictably, complaints are pouring in from people around the world linking their smart meters to sleeping disorders, headaches, leg cramps, eye problems, heart problems, and fatigue. Commercials show children and young adults with cell phones against their heads, smiling and interacting happily with others. Critics claim these ads are just as disturbing as images of children smoking cigars, drinking tequila, or playing with revolvers. Children and teens are more vulnerable to cell phone radiation because the bone marrow of a child’s head absorbs 10 times more radiation than that of an adult. Yet a study reveals that, on average, a child receives their first cell phone at age six. In Davis’ Disconnect she writes that as far back as 2001, a commission of the Royal College of Physicians issued a report that children may be more vulnerable because of their developing nervous system, the greater absorption of energy in the tissues of the head, and a longer lifetime of exposure. The report recommended that the mobile phone industry refrain from promoting the use of mobile phones to children and that the widespread use of mobile phones by children for nonessential calls be discouraged. Pregnant women should also use cell phones cautiously. Reports from Yale University’s chief of obstetrics and gynecology, Hugh Taylor, found that prenatal exposure significantly increased hyperactive behavior in offspring and altered brain chemistry. Lobbyists from the telecommunications industry were suspected of having something to do with keeping the information in the document suppressed for all those years. Critics of CTIA see parallels to the tobacco lobby of 50 years ago which used public misinformation campaigns and pressure on the courts to keep warnings off products. However, the telecommunications industry denies this, saying it does issue warnings (which in itself is an admission of something). The industry’s long-held defense has been that no major significant study definitively links cell phone use with cancer. But in May 2016, federal scientists released findings on a $25 million animal study that proved the relationship does exist. The findings were so convincing that some of the researchers admitted they were “shocked” and “concerned”. Texting is better than talking — With a text, your phone only needs to ping the cell phone tower for a moment, so when compared to a 15-minute phone conversation, it’s not emitting nearly as much radiation. Distance is your friend – Keep the phone away from sensitive body parts. Don’t stash it in your bra, pants, or shirt pockets. Pregnant women should keep their phones away from their stomachs. Avoid holding a cell phone directly up to your head. Use a speakerphone. Keep a distance while waiting for a connection –The most radiation is emitted (up to 3,000 times more) when cell phones are attempting to connect. Turn off your wireless router at night to minimize exposure to radiation. Don’t attempt calls on a weak signal – One bar or less means your phone has to work harder to get through to the cell tower, and working harder means more radiation. Wait for a strong signal. Don’t try to guard your phone to reduce radiation. The phone will automatically compensate by boosting the signal to maintain connection. This applies also to areas where the signal is weak. Use a landline when you can. Not as cool but much safer. Eat green vegetables and berries– Veggies and a good night’s sleep in a dark room will enhance natural repair of DNA that may be damaged by cell phone use. Ground yourself frequently – with earth, water and nature, to allow your body to repair free radical damage. Reduce use – Turn your cell phone off more often.Reserve it for emergencies or important matters. Never walk or hike with your phone with signal on roam. Look at the SAR – Buy phones that emit lower electromagnetic frequencies. Samsung, good. Apple iPhone, bad. Put it to sleep – Turn your phone off at night. If you use headphones, beware that headphones themselves can act as an antenna and even strengthen the EMF signal that reaches the brain. Keep a straight cord and at least a meter’s distance from the phone when you talk. Put your phone to flight safe when traveling, to avoid for higher radiation exposure when the cell phone looks for repeater stations. Replenish your access to natural fields which have a regenerative effect, such as Schumann Resonances, a planetary wave that is shown to work against EMF damage on a cellular level and is scarce in city conditions and rich in nature. That means more forest, mountains and nature. Schumann Resonances may in fact offer the most significant help in the future to guard us against EMF damaging effects. Since it is almost impossible to protect ourselves fully against the manmade EMF, the focus will need to be on creating more cellular resistance and ability to regenerate. Artificially generated Schumann resonances have been shown both in space and underground conditions to be able to counter the damage as well as exposure to nature. But there is a dramatic difference in quality between commercial Schumann resonance generators. A medically licensed, top of the range machine is WaveLife E-Relief, manufactured in Switzerland and used by prominent doctors primarily in Europe as a therapeutic device for cellular revitalization, available for consumers in early 2019. In Disconnect, Davis recounts the 1960s case of American biologist Allan Frey whose study sponsored by the Office of Naval Research showed that microwave radiation weakens the membranes surrounding our hearts, brains, eyes, and lungs. After his work appeared, information in the US on this topic disappeared. Funding for further research no longer existed. One can only imagine how Frey and other early researchers of EMF felt as they witnessed the subsequent rise of cell phones and the accompanying disregard of the serious health issues attached. According to Davis, Frey bemoaned the potential health crisis facing the billions of cell phone users kept in the dark too long about this dangerous connection. The onset of the 5G in 2019 serves as an acute reminder of how important this topic has become. Thousands of scientists have appealed for more controls and action against 5G, which is already known to be much more damaging to cell life. The millimeter wave frequencies and the need to set up stations every 100 meters means that soon there is no safe urban areas left. Read about the International Appeal Against 5G by a group of doctors, scientists, citizens and environmental organisations and keep an eye out for the first 5G tower in your hood. To remain healthy today requires increasingly more individual research and effort, especially when it comes to manmade EMF. One great place to start is the Bioinitiative Report of 2012, a look at biological exposure standards of EMF that was compiled by 29 authors, including 21 PhDs and 10 MDs, with deep expertise in this field.